Do you remember the first time Jose Mourinho came into the football world's consciousness? That was in 2004, during Porto's away game at Manchester United. With the poised at one goal to the home side who needed only to see the game out to win the encounter on away goals rule, Costinha pounced. After Howard was only able to parry Benni McCarthy's freekick, Costinhas struck to level matters, and give them an aggregate lead of 3:2. After the final whistle, the image that many would remember and one is often replayed would be of Mourinho, then Porto coach celebrating like an unhinged bolt on the Old thrafford pitch, while Alex Ferguson looked on, his face distraught with embarrassment and the agony of defeat. Even though the Porto players showed the proverbial "character", their Manager's action made sure all the attention accrued to him alone. Infact, some point to that moment as the birth of football coaches as superstars. the same man is yet at the center of it all, this time, asking the other team for respect. This was a man whose reputation was built on him sliding in celebration on the same pitch, and in utter disrespect of the team he now manages. Yet, many seem to have amnesia and miss the irony of it all. 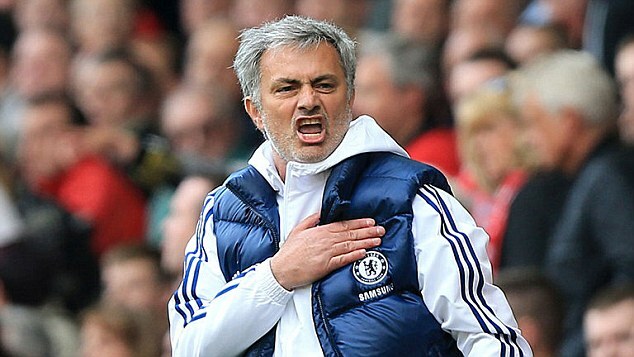 Jose Mourinho, epitomises, amongst other things, is a sore loser and an arrogant winner. When he loses, hell is let lose, and when he wins - especially against a rival, he is unbelievably smug. Remember the urge to call his wife before the end of games when his team looked to have all but secured the win, the sliding celebrations, or the beating of his chest, as was the case when Chelsea ended Liverpool's hope of winning the league. Mourinho asks for respect, but keeps it when its hi turn to give.